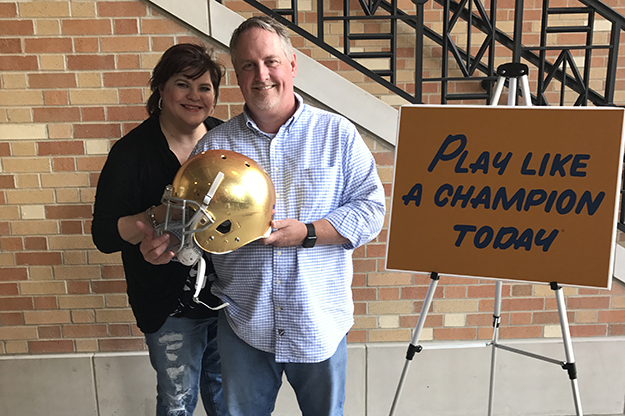 Amy Henley, dean of the UND College of Business & Public Administration; and husband, David Cason, an assistant professor in the UND Honors Program, moved to Grand Forks this fall and brought their love of college football with them. Henley grew up around the sport in Mississippi and her affection for it never faded. Image courtesy of Amy Henley. The University of North Dakota’s College of Business and Public Administration (CoBPA) has a new dean who has a special place in her heart for academics and football. Dean Amy Henley grew up in the south and was born into a family that loved Southern Mississippi football. Her uncle played football there and her dad went to the school as well. Her parents were donors to the school, and traveled every weekend to go to the games in the fall. Henley’s dad always made sure that she appreciated what she had and understood the importance of the opportunity to go to college. Henley credits college football as the reason she chose a career in academics. 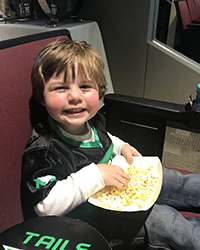 At the end of August, UND football had their home opener against Mississippi Valley State and won 35-7. Henley had the opportunity to attend the tailgate and the game with her family. She noted with a smile that UND was 1-0 under her expertise. She was especially excited to meet the people in the Champions Club tent. “I got to meet the people that I consider were much like my dad, who supported their alma mater, supported their institution,” said Henley. Henley was pleased to meet people who are as excited about football as she is. 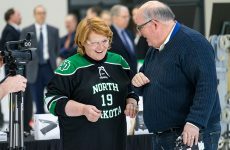 She especially enjoyed meeting the people who help provide funds for both academic and athletic scholarships, which promote experiential learning for UND students. Henley felt that the atmosphere in the Alerus was both enthusiastic and family friendly. This was great for her, because she brought her two-year-old son, Collier, along for the fun. Collier, who is named after former Southern Mississippi Quarterback Reggie Collier, sported his brand new UND football jersey at the game. One thing that Henley is proud of is the number of student athletes in the College. “Forty percent of the student athletes at UND are in the College of Business and Public Administration, and I take that very seriously,” said Henley, who emphasized about the large load that student athletes carry. One person who knows the relationship between academics all too well is former UND kicker Reid Taubenheim. Taubenheim finished out his football eligibility last season with UND, and will complete his accounting degree with a minor in economics this December. 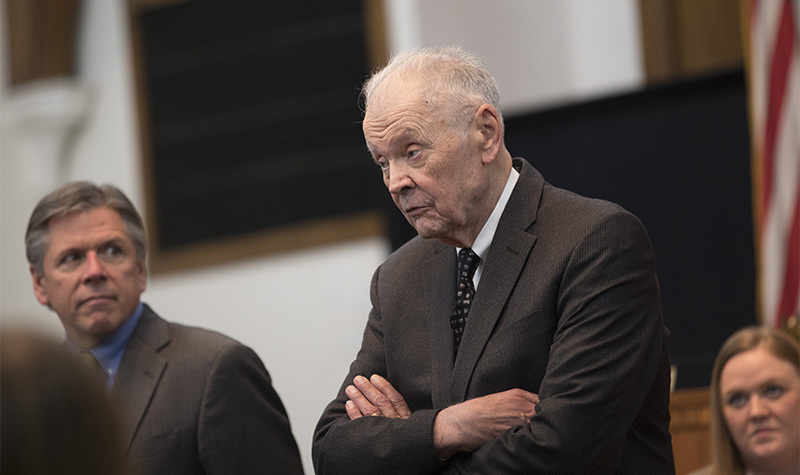 Taubenheim has been heavily involved in many things during his time at UND on both the athletic and the academic sides. To name a few: he played on the UND football team, he was the Vice President of SAAC (student athlete advising committee), the President of Beta Alpha Psi, he served on the Athletic Director search committee, interned at Deloitte, interns for the Alumni Foundation Champions Club in fundraising, and was the president of the Accounting Club. Following graduation in December, Taubenheim accepted a job at Deloitte – one of the “Big Four” accounting organizations. Taubenheim knows the importance of the academic body of UND supporting the athletic body and vice-versa. Taubenheim noted the importance of involvement. Taubenheim says that the most important thing to UND football coach Bubba Schweigert is championship behavior. What is championship behavior? “It’s really just a matter of doing the right thing. Whether that is going to class, or answering something in class, or doing your homework, or even just out in the community. You know, you see somebody throw trash on the ground, pick that up and throw it away. Really the entire time that you spend in Grand Forks and especially at the University, you’re representing a brand, and that is football,” said Taubenheim. Former UND football player and current chair of True North Sports and Entertainment, which owns the Winnipeg Jets, Mark Chipman, will be coming to UND this fall to talk about topics similar to championship behavior as the keynote speaker for UND’s 14th Annual Olafson Ethics Symposium. 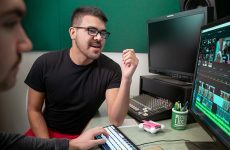 With the positive attitude towards academics and athletics from students and administration alike, UND is set up for a great year in the classroom and on the field. Dean Henley is excited for what’s to come, and so is Taubenheim. “I’m really excited for our new dean and I think that we have a lot to look forward to here,” said Taubenheim.